It was heartbreak for Windsor Stars at McHugh park on Friday nigth, as a late Sigma goal sunk the home side's final hope of silverware this season. As a result of a late mistake, which released Sigma on a lethal counter attack that was capped off by Johnny Grant, the Stars bowed out of the league cup. The game started a bit late after a traffic delay on the 401, but once the game was underway the fans were treated to a high octane affair. The first chance fell to an unlikely target. Stars centre-back Chris Suta ventured forward into the opposition's half, and found himself in the box with the ball at his feet, but the finish was lacking any finesse to beat Sigma keeper Corey Marques. Marques would play a big part in the proceedings. The keeper was called into action again in the thirteenth minute of play, as Windsor's Dragoi was able to find enough space to create a chance, but his shot was palmed wide by Marques. Two minutes later, Dragoi was handed another chance. A free kick from twenty yards was well placed, but the strong hands of Marques denied him again. The chances were adding up for the home side. Patrick Lapera has proven to be a great asset on Windsor attacking corners, and it was the towering defender who would once again have a great chance to put his team ahead, but the header was deflected wide. Sigma created a chance in the twenty-sixth minute, as winger Marcel Zajac beat a couple defenders on the run, but the angle proved to be too tight and the shot was sent just wide of the target. A moment of controversy struck in the thirty-seventh minute. Manny Morgato, who had received a caution for an earlier tackle, yanked down Windsor's Noah Pio. The professional foul was not penalized, the first of many decisions that would draw the ire of the home crowd. Windsor's Brett Holmberg had a glorious opportunity to put his team up right before the break. When a cross was played to the far post, the charging forward got a head on the ball, but the attempt sailed over the net and both teams headed into the locker rooms scoreless at the half. After the half-time team talks concluded, both teams stepped on to a pitch now draped in heavy fog. The night had begun to cool, but the Stars were red hot and continued to press for the win. Three minutes into the half, Lapera once again found himself on the end of a great corner. The defender's header almost broke the deadlock, but was cleared off the line by an alert defender. In the fifty-seventh minute, Holmberg dribbled the ball over his sliding marker, and broke in alone on the keeper. Strong reflexes from Marques appeared to save the attempt, however the rebound rolled in front of goal. The open chance fell to Noah Pio, whose lash of a shot sent the ball sailing over the net. In the sixtieth, Sigma were awarded a free-kick in very dangerous territory. The attempt from twenty yards out was shot wide, and didn't trouble keeper Anthony Santilli, but it was the first sign that the visiting side may be coming to life. A few minutes later the Stars had a chance of their own, as Stephen Ademoulo created a glorious opportunity with a perfectly weighted ball through to Dragoi, but the veteran midfielder struggled to keep the shot on target. 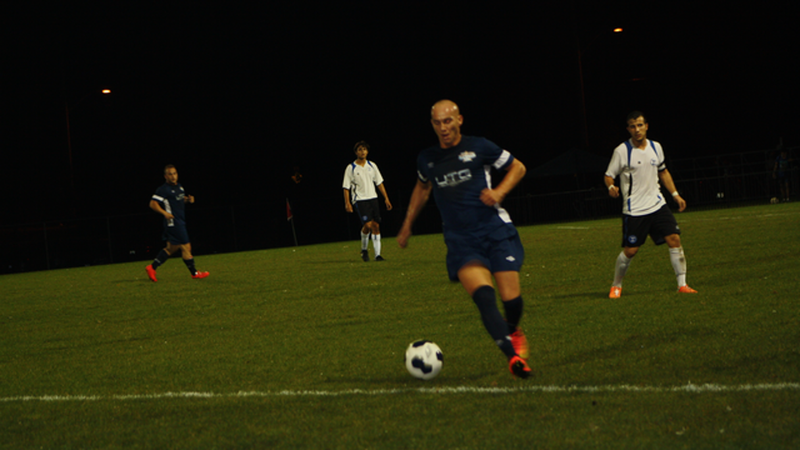 Both teams began to press for the breakthrough goal as the game drew to a close. Sigma were quiet all evening, but displayed significant threat on the counter. Substitute Lucas Ferritto latched onto a pass in the box, but the forward struggled to get the ball out of his feet, and the attempt lacked power to bother the net minder. Another call late in the game left the Stars' bench enraged. When a ball was crossed into the box, Holmberg was brought down while the ball was still in the air. The ref kept his whistle in his pocket, and signalled for play to go on. In the dying minutes of the game, a mistake in midfield allowed Sigma to break on the counter. With the defence scrambled, Johnny Grant took advantage. Making a great cut into the box, and with the Stars' defenders on their heels, he was able to carve up enough room beyond the keeper's reach to score the game winner. The Stars were distraught after the late goal; wasted chances on the night will haunt the home side long after the final whistle on the contest sounded.